One of two crop circles which were discovered on August 9, 2012 at Cheesefoot Head, U.K.
Just this morning I was expressing my amazement to a doctor with whom I work about how many complex crop circles are created without errors in their execution. Today. this one appears. One would think that an error made in the creation of a crop circle would be an obvious and glaring error when viewed from the sky, yet this design, despite its obvious complexity, has no errors that I am able to discern. It is a beautiful design, and I am awed by its perfection and I am grateful for its creation. We see this same level of complexity and perfection in many hundreds of other crop circles which have been created over the past several decades, for free, and without claim of “authorship”. I will state unequivically that the most complex and beautiful crop circles never have apparent errors! How can this be? During this conversation the doctor I was speaking with told me that at the hospital in which he trained there were a series of ramps built that went all the way up the side of the hospital, and that these ramps had been constructed with the intention of having a means of evacuating patients who were unable to walk, and therefore required transport on guerneys, from the upper floors of the hospital to ground in the event that a fire or other disaster occurred and the elevators were rendered non-functional. Only after the entire ramp system was built did they realize that the turning radius at the end of each ramp was too short to allow a standard size guerney to make the turn at the end of each ramp, and thus the entire ramp system was unusable for the intended purpose! I ask you to consider this story as you view the perfection we see in the layout of this crop circle. Consider as well that this crop circle was very likely created at night in the dark, under a severe time constraint, without the benefit of a full moon, and that this crop circle is physically located very nearby a busy highway. Also, this was one of two crop circles which were created in the same field, presumably on the same night. Now, explain to me how these events happen over and over and over again without the arrest of the perpetrators who are trespassing and vandalizing a farmer’s crop field, thousands of times, over three decades. Those who continue to insist that crop circles are the work of human vandals have a lot to explain when the circumstances surrounding these events are carefully considered. The crop circles are an ongoing phenomenon that deserve everyone’s attention. There is truly a miracle taking place here on Earth, right in front of our eyes, yet most remain blind or at least highly skeptical of the very likely explanation that these are the product of a non-human intelligence. The human ego appears to know no bounds, and that is a large part of the reason we find our civilization in the mess that it is in. As a civilization we seem to be incapable of recognizing and acknowledging work which is, under the circumstances in which it occurs, beyond human capability. Perfection is not human. Human beings are not capable of consistently doing error-free work, over and over again, thousands of times. Period. 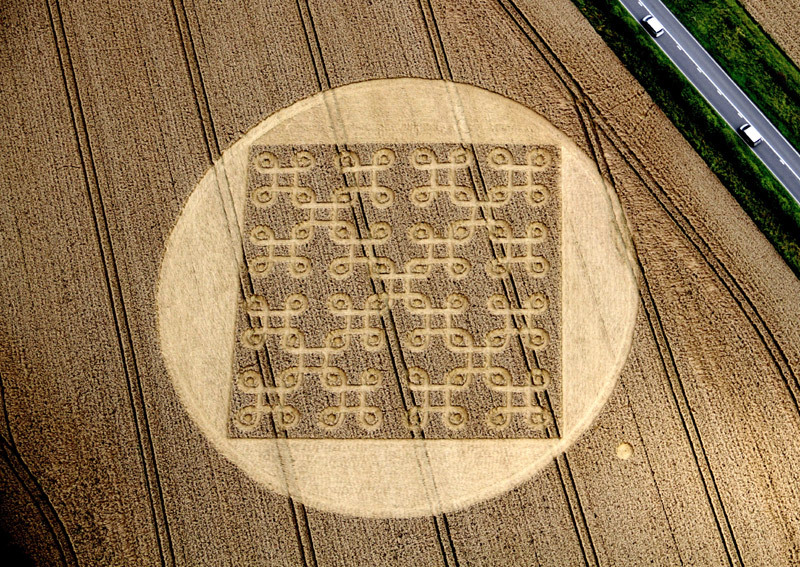 My gratitude to Crop Circle Connector for presenting this crop circle, and to Jason Patterson who took the photograph. The danger is that people just look at the pictures and make assumptions. Very few crop circles contain errors, yet does that mean it definitely wasn’t made by humans? Some of the the circlemakers have been doing this for almost thirty years, that is plenty of time to perfect the art. If you look at the close-up pictures of this formation, some aspects of the knotwork are better in some areas than others. Why should this be if it was the work of a paranormal force? The formation that appeared this year at Jugglers Lane, nr Yatesbury was hailed as perfect, wonderful, pristine etc etc yet a few days later it was revealed to be man-made as part of an education class. The formation looks fantastic, but it was made by people who had never made a crop circle before, and it looks amazing!